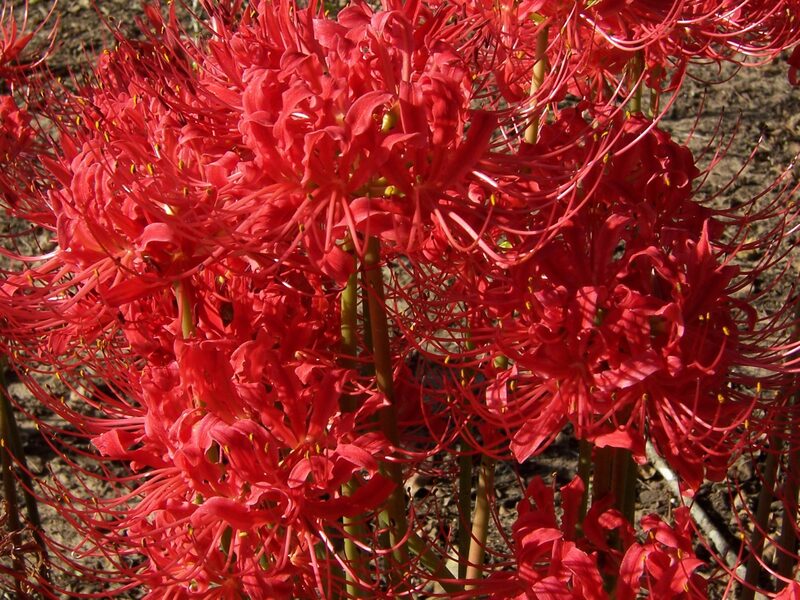 October started out with a grand display of heirloom spider lilies (Lycoris radiata radiata). These Asian amaryllids were always one of my childhood favorites, blooming about three weeks after the first good fall rains and providing the opening chorus for the late season flowers to follow. I enjoy autumn more than I do spring, mainly because of fewer allergies, but also because we aren’t overwhelmed with a profusion of disparate flowers all shouting “look at me”, “look at me”, like a pasture full of Bart Simpsons. The fall colors are also more related to each other, providing a more harmonious display than the raucous spring blend. 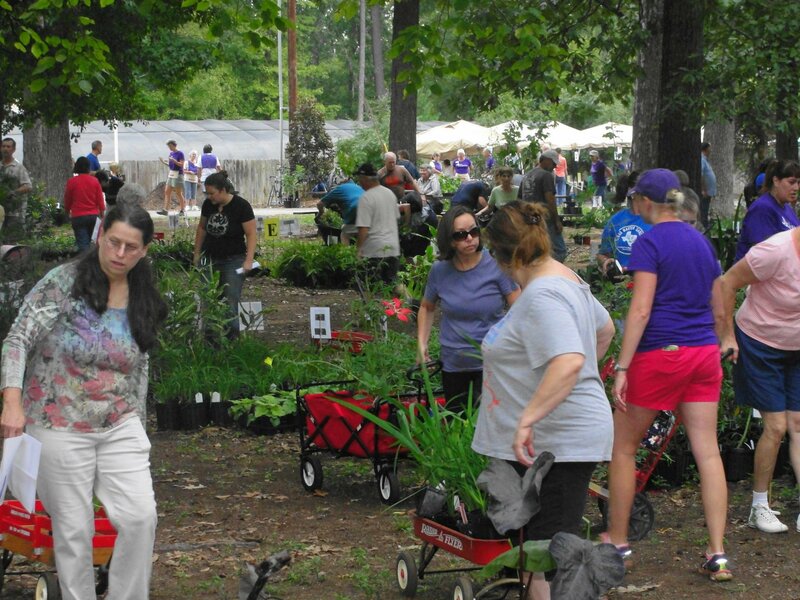 It was an extremely busy first week preparing for our October 5th annual fall plant sale at SFA Gardens in Nacogdoches. We had around 400 different plants for sale, a good crowd, and made enough money to support our gardens and educational activities until the April 5th annual spring sale. The next morning after the sale my good friends with the Texas Rose Rustlers visited Arcadia. They were working their way home after visiting Chamblee’s Roses in Tyler and King’s Nursery in Tenaha. They were a little early for my rose show but got a full dose of the dogs and my mom’s brunch instead. I used to be a member of the Texas Rose Rustlers back when Bill Welch, Pam Puryear, and Margaret Sharpe were running the show. It was a magical time while also being employed part time at the famous Antique Rose Emporium. 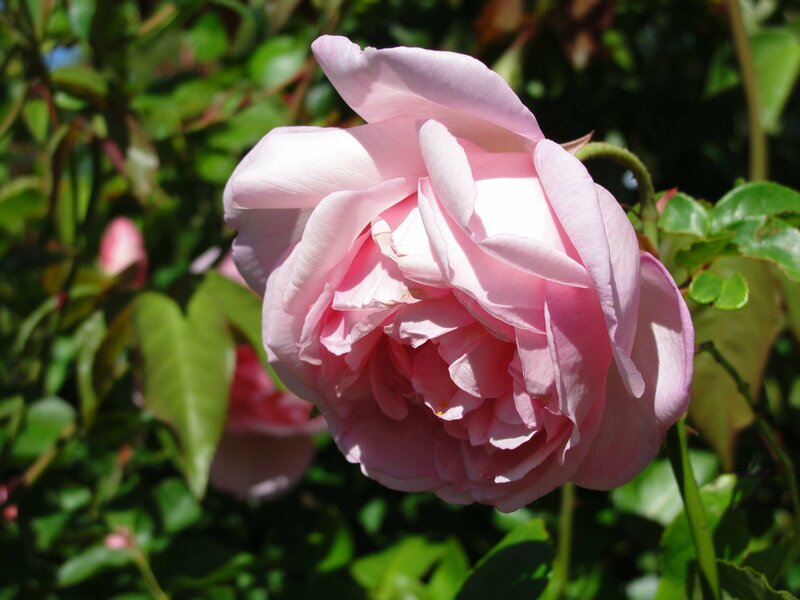 After my experience observing surviving and thriving roses throughout the state over the years, I wouldn’t think of growing anything but tried and true antiques. Next I was invited to an Angelina County native plant committee luncheon at the beautiful History Center in Diboll. 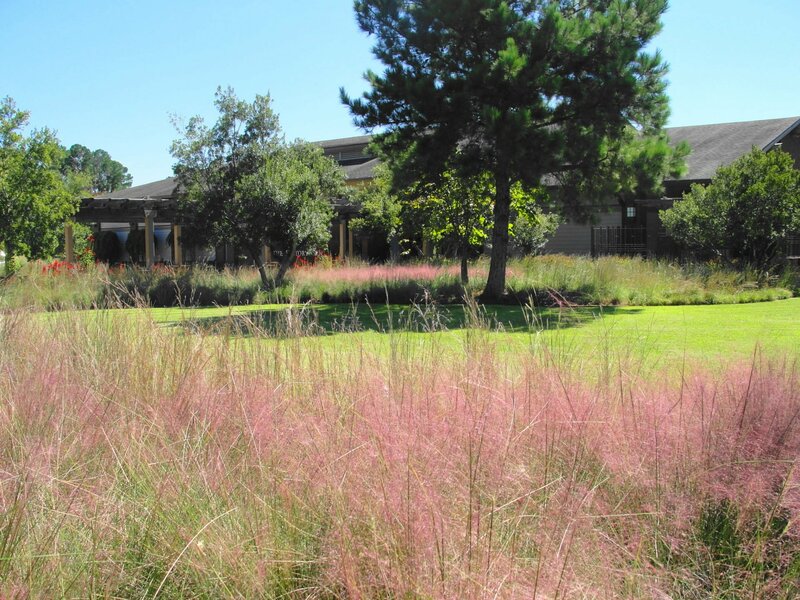 In addition to wonderful fried chicken, green beans, and mashed potatoes, I was treated to their grand display of native grasses showing off in their landscape. Then I hosted an appreciation meal of pulled pork in Arcadia for my SFA Pineywoods Native Plant Center staff and volunteers. My brother-in-law Reed gifted me with a smoker and I’ve gotten pretty good with it using local oak and hickory. My partiality to pork always betrays my Texas roots and shows my even deeper Southern roots. I also had Steve Adams from Aiken come rework and finish my iron ore gravel driveway. Most normal folks looked at it and assumed I was going to be covering it with asphalt or concrete, but I’m very comfortable with my little “red dirt road” drive as it’s more in tune with the old house and countryside. I lined it with some more post oaks (Quercus stellata) to replace the myriad that I’ve lost over the years here. Old gnarled posts oaks have always been the dominant tree in Arcadia proper. They aren’t flashy and generally sport no fall color, but I’ve always loved them nonetheless. Acorn Forestry also showed up to apply herbicide on my future longleaf pine planting site to help discourage competition after my pines are planted this winter. Now I have to worry about wild hog damage and how and when I’m going to seed my native grasses. Next on the agenda was more company. My old friend Mel Pel who worked with me in the LSU Department of Horticulture during my Baton Rouge days, decided to pay me a visit. It seems that I left Baton Rouge owing her. Turns out she wanted me to landscape her patio in South Louisiana to make things even. It sounded harmless until I got there and found it was a much bigger job than I anticipated and was going to take multiple trips to even make a dent in it. Heck, it’s five hours away. She’s pretty bossy, too. Let this be a lesson to pay up on your debts when they are current and it’s convenient to do so. Since I can barely look after my own garden, I make it a habit to not hire out for landscaping or consultation. What was I thinking? She’s an older gal, so the chances of her finding or reading this blog are slim. Keep your mouth closed please. 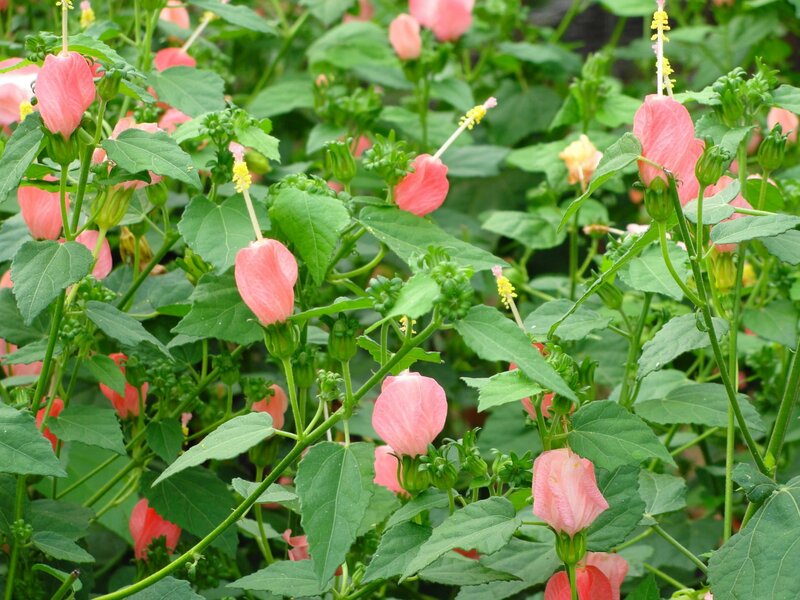 The drought busting rain perked up my garden a bit, especially the Pam Puryear Turk’s caps and their usual swarm of fall hummingbirds. It has also allowed me to harvest fresh spinach, green onions, purple podded pole beans, and cucumbers from my back yard tire parterre. And thanks to Uncle Noel, I seeded every kind of green they sold at the feed store in Center in my bulb patch behind the Masonic Lodge, so we’ll be guaranteed to have turnips, mustard, etc. throughout the winter and spring. I also seeded a wildlife mix cover crop on my unused vegetable rows and other bare plots. Not doing so results in aggravating and wasteful soil erosion. And finally, my friend and master carpenter Larry Shelton came out and built my simple little rose arbor which meant keeping the hens penned up for several days. They aren’t laying much each day so I’m catching flack from my mom about egg inventories. Thanks to an ad I ran across on shelbycountytoday.com a man in Shelbyville also gifted me with more than a dozen Coo Coo Maran chickens, mostly roosters. They look like Dominikers and are most noted for the hens laying the darkest brown eggs of any breed. They are six months old and the overly active roosters will be perfect for holiday dressing, dumplings, and gumbo. I think there’s a hen or two in there and can’t wait to see their eggs! We had a great SFA Gardens lecture series in October with Dr. Matthew Kwiatkowski from SFA teaching us about backyard amphibians and reptiles, always favorites of mine.